At Timber Pro, we don’t condone issuing general statements such as “our products are low VOC and compliant in all states” because it’s vague and doesn’t provide the facts consumers need to make informed decisions. It is our opinion that low-VOC (volatile organic compounds or fumes) should be 150 grams per liter minus water or less, because we know its possible to make high quality durable products at that low level. Some coating companies make it extremely difficult to find out what the actual VOC level is, but we make this information front and center on all our products which range from zero-VOC to 143 grams per liter minus water. Until terms such as “green,” “sustainable,” “non toxic” or “environmentally safe” have legislation to govern their use, consumers must have access to the critical information they need. We challenge all other coating companies to make this VOC information easy for consumers to access. Timber Pro Coatings has been manufacturing green and sustainable wood finishes and concrete sealers since 1996, thirteen years before the trend became a movement. Now, we have earned the right to call ourselves “pioneers” in the creation and promotion of environmentally safe building products. We pledge to continue to lead by example, and remain at the forefront of change. The growth and success of Timber Pro is proof that our environmentally safe wood finishes and concrete sealers finishes really can outlast, and soon outsell the hazardous finishes still being marketed today. Timber Pro UV wood stains are waterborne, and made primarily from bio preferred plant-based oils blended with a small percentage of acrylic to boost durability. We make every attempt to use natural ingredients because Mother Nature knows the best way to protect from water absorption. 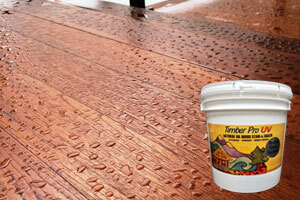 Timber Pro UV Wood Finishes and Concrete Sealers can deliver up to 3 LEED credits.